SynthScaper nominated for "The Best new iOS app of 2017" by MusicRadar. SynthScaper nominated for "The TabMuse Top iOS Music Apps of 2017". Buy this app now! Next free update will add advanced feature called Designer that lets you easy create and tune an infinite number of new presets. With using technology of neural network the Designer generates new presets and scenes based on existing and gives you several simple controls to select complexity and variety of the new sounds and also lets you tune generated presets. Music “Blue Movement 02”. Composed and performed by Andrea Bigiarini on SynthScaper and SoundScaper apps for iPad. 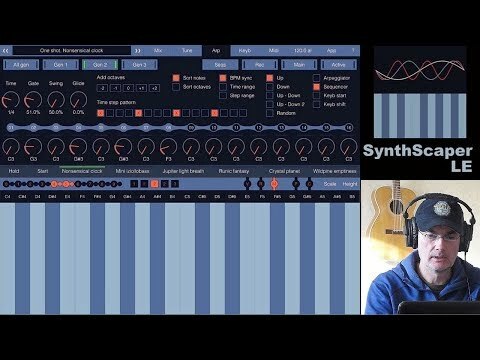 SynthScaper - Synthesizer specially designed for creating and experiments with ambient soundscapes in wide range from noises to melodic instruments and everything in between. SoundScaper - An experimental sound mini lab for creating unusual soundscapes, atmospheric textures, drones, glitches and noises based on circuit bending principles.